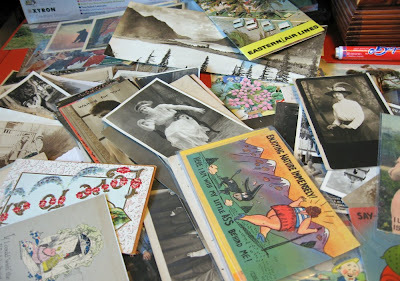 I spent about 5 or 6 hours in the last two days at the Webfooters Postcard sale. It was great, but surprisingly exhausting. Leaning over cardboard boxes and looking through 8000 cards (my guesstimate) is hard work. But, I got some great stuff. This shot only shows some of it. Got some great photos, postcards and some greeting cards, too. If you like photos of women I have some gorgeous ones I got for the shop. Hopefully I can get those up soon. I also got to a yoga class this weekend, made a nice halibut dinner for the mister and myself, and spent some time in the sun today potting a plant and just plain sitting and letting the sun soak in. It is beautiful today. I am looking forward to sharing with you some of the new stuff I got. Hope you all had a great weekend.